Just like its namesake cocktail, the classic Negroni, the Negroni Bianco strikes a perfect bittersweet balance with every sip. Combine all ingredients with ice and stir to chill. Strain into a chilled coupe and garnish. Combine all ingredients in clean glass jar with a lid, shake and let rest for 3 days. Will keep refrigerated for up to two weeks. 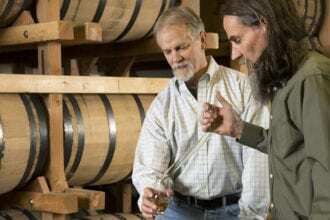 The brewers-turned-distillers talk about the intersection of beer and whiskey.